Computer Assisted Instruction (CAI) refers to instruction or remediation presented on a computer. Many educational computer programs are available online and from computer stores and textbook companies. They enhance teacher instruction in several ways. Computer programs are interactive and can illustrate a concept through attractive animation, sound, and demonstration. They allow students to progress at their own pace and work individually or problem solve in a group. Computers provide immediate feedback, letting students know whether their answer is correct. If the answer is not correct, the program shows students how to correctly answer the question. Computers offer a different type of activity and a change of pace from teacher-led or group instruction. Computer-assisted instruction improves instruction for students with disabilities because students receive immediate feedback and do not continue to practice the wrong skills. Many computer programs can move through instruction at the student’s pace and keep track of the student’s errors and progress. Computers capture the students’ attention because the programs are interactive and engage the students’ spirit of competitiveness to increase their scores. Also, computer-assisted instruction moves at the students’ pace and usually does not move ahead until they have mastered the skill. Programs provide differentiated lessons to challenge students who are at risk, average, or gifted. This particular study was made to ease some difficulties in student learning. In this Computer Aided Instruction (CAI) system, a material DBMS using MySQL is integrated to challenge the students who have less interest in DBMS. It may provides many instructional benefits and can have much greater impact on student learning, because students can often work independently or in pairs at computers around the room through a series of interrelated activities, instruction and coping a variety of learning styles. Students enjoy working in a Computer Aided Instruction for DBMS using MySQL for it provides them immediate positive feedback. 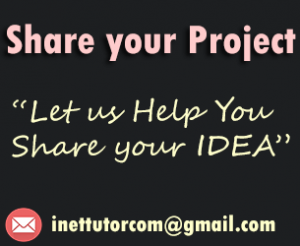 The selection of this project was developed through survey, research, interview and further study of the proponent to gain more ideas in helping both students and instructors in some ways of teaching. The study aims to be a part of students learning in developing their potential to excel in their field in Information Technology by providing opportunities in easy ways and accessible tool of learning to enhance their undeveloped skills. Students will acquire knowledge and experienced by using CAI. The purpose of this study was to determine how computer-assisted-instruction improves student performance among various types of students. There is no doubt that technology has incorporated into our school systems. Computers are used not only as a means of helping schools analyze data, computers have become a pervasive tool toward optimizing student learning. For example, students are regularly using the Internet to gather and assimilate information for use in research assignments. They are preparing “electronic” presentations using computer presentation programs and LCD projectors. They are using word processing programs to create various other reports. Students are even using spreadsheets to increase their experiences with mathematical concepts. In addition, many schools have incorporated interactive computer-assisted-instruction into their program to provide students opportunities to master specific educational objectives or standards. To promote an automated approached of teaching in the IT Department. The Computer Aided Instruction for Database Management System aims to integrate a faster and easier way of teaching DBMS using MySQL through computer instruction. It will help students to utilize their knowledge and skills in a convenient way. Its goal is to let students study by themselves with the instruction given. Computer programs will allow students to progress at their own pace and work individually or problem solve in a group. Computers provide immediate feedback, letting students know whether their answer is correct. If the answer is not correct, the program shows students how to correctly answer the question. Computers offer a different type of activity and a change of pace from teacher-led or group instruction. Also, computer-assisted instruction moves at the students’ pace and usually does not move ahead until they have mastered the skill. Routing students through a series of courseware instructional programs. Recording student scores and progress for later inspection by a courseware instructor. This study will cover on the introduction to MySQL, in creating tables and databases, inserting of records and multiple records in a single query, updating and deleting records. MySQL commands will also be discussed like the SELECT DISTINCT command, using the WHERE clause to filter records, sorting records using ORDER by clause, selecting records using AND/OR operators, the GROUP BY clause, limiting data retrieval, LIKE operator, SQL aggregate functions, using column aliases, using HAVING clause, using the IN function, using BETWEEN conditions. These topics will be presented by MS PowerPoint and videos or demonstrations for the students to understand it well and for them to be entertained in order to encourage their active participation in DBMS. This contains related literature and system in Computer Aided Instruction. It serves as a guide to student researchers in developing another Computer Aided Instruction as a tool for enhancing quality education. Computer-assisted instruction (CAI) consists of computer technologies that aid or assist education; these technologies include guided drill and practice exercises, computer visualization of objects, and computer-facilitated communication. This paper examines computer-assisted instruction in terms of its effectiveness as an educational technology for reading. CAI helps to improve reading but it has some definitive limitations. The paper begins with a discussion of the general effectiveness of Computer Assisted Instruction across all subject areas; this discussion is followed by an examination of CAI. The paper ends with an overall evaluation of the extent to which CAI should be considered feasible for use by the education system for the purposes of the acquisition and development of reading skills and abilities. The first point that can be noted regarding Computer-Assisted Instruction packages for reading, or for any other subject, is that they are effective. One of the most important reasons is that students like learning in the environment that the computer has to offer. Computer Assisted Instruction for Autistic Children. Since the beginning of 1980, Computer-Assisted-Instruction (CAI) has been used systematically in special education. The use of computers in the treatment of autistic children is highly controversial and emotional among parents and professionals. Parents report positive effects of CAI on learning and behaviours of students . The following paper relates perception, motivation, communication and behaviour–characteristics of autistic children to features of computer-assisted learning. Preliminary findings support the benefit of the use of computer-technology for the management of behaviour and learning of autistic children. In 12 autistics, video-taped evaluations showed higher enthusiasm ratings in computer-sessions than personal instruction sessions. Single case studies demonstrated a positive influence of CAI on autistic children’s behaviour-problems (e.g. avoidance of eye contact, echolalia) as well as improved spontaneous communication and better learning of academics. The purpose of this study was to compare the effects of automated versus teacher-controlled instruction in the education of autistic children. Many students entering college need further preparation in mathematics in to successfully meet their educational and career goals. Many colleges and universities offer developmental mathematics courses and other services to prepare these students for college-level math courses. Traditional teaching strategies have produced low passing rates in developmental mathematics courses. Colleges and universities are trying alternative instructional approaches to improve the teaching of developmental mathematics with the goal of increasing the number of students who have the skills and knowledge required for college-level math courses and for the twenty-first century workforce. Computers and the internet make possible new methods of delivering instruction so students will have choices of when, where, and how they learn math. This study will investigate whether there are differences in the academic achievement of students enrolled in a developmental mathematics course using traditional instruction, traditional instruction supplemented with computer-assisted instruction, or an online distance-learning course. It will also investigate gender differences in mathematics achievement. The study will be conducted in Intermediate Algebra classes at a large, private, eastern university. The use of computer technology to supplement traditional instruction and to deliver instruction online to developmental mathematics students is a recent development. Although considerable research indicates that computer-assisted instruction can have a positive impact on learning for students of all ages and in a variety of content areas, the research is limited and inconclusive for students in developmental mathematics. At present many schools, both high school and elementary, are now using computers in the delivery of lessons, called the computer-assisted instruction (CAI). Teachers have already seen the advantages of CAI as a way of solving the problem on individual differences of students in learning. The researchers have developed CAI lessons in high school physics that are interactive in nature, i.e., students are allowed to answer questions posted in the programmed lessons. The developed CAI lessons are learning tools that can greatly help the students and teachers. Students do not get bored. Motivation was carried all throughout the program and students’ interest is maintained if not strengthened through the program’s artistic presentation. The CAI lessons are content-oriented and artistically presented, the teacher’s role shift from didactically transmitter of knowledge to a facilitator in the student’s assimilation of knowledge. Furthermore, the teachers could make use of the class time more effectively and attend to the needs of students whom they have not been able to meet. Provided computers are available, CAI lessons offer solution to issues/problems related to large classes. Biology occupies a unique position in the school curriculum. Biology is central to many science related courses such as medicine, pharmacy, agriculture, nursing, biochemistry and so on. It is obvious that no student intending to study these disciplines can do without biology. These factors, among others, have drawn attention of researchers and curriculum planners towards biology as a subject in the school curriculum. There are now several CAI packages on different subjects. It is obvious that the current trend in research all over the world is the use of computer facilities and resources to enhance students’ learning. They further showed that the interactive approaches to lecturing significantly enhance learning. Furthermore, computer assisted instruction has been found to enhance students’ performance than the conventional instructional method in counselor education. This is because use of technology involves human dimensions of caring, community, and commitment. Using technology in ways that promote sequenced learning within groups can lead to more in-depth processing of course content and, hence, more retention of information. Thus, much remain to be empirically studied on the effect of CAI in biology education. The promise of computer-assisted instruction (CAI) was recognized long ago, but CAI is not widely used in college-level science and engineering curriculums. Traditional classroom instruction is being enhanced through the use of new technologies such as simulation and visualization, e-mail, discussion groups, and web browsing. Television and computer conferencing are extending the classroom to homes and offices. But stand up lectures remain the method of choice for delivering classroom instruction. In this paper, we describe an educational software package called ALECS(A Learning Environment for Computer Science). ALECS has been used in a first semester computer science course to dramatically reduce the time devoted to stand up lectures, which gives the instructor more time for tutoring. ALECS (A Learning Environment for Computer Science) is an educational software package that assists instructors in teaching the C++ programming language and fundamental concepts of computer science. ALECS provides assistance in the following areas:Instruction-ALECS is a collection of lessons consisting of hypertext, graphics, voice annotations, animations, case studies, and closed labs. Feedback-ALECS provide feedback to students through the use of quizzes, practice exams, and programming assignments. Student programs are automatically assessed by running them against test cases provided by the instructor and analyzing them for conformance to instructor-defined coding standards tracking: ALECS tracks student progress and performance information and records it in a database. Computer has become an important tool for keeping databases, filing systems, track records. It has made record keeping much easier than it ever was. It has made data analysis extremely easy, and it can be done at a single click of the mouse unlike the traditional way of teaching that needs a lot of times in reading books .While using CAI as an instructional way of teaching students are more interested in reading their lessons . Computer Aided Instruction for DBMS using MYSQL is accessible and can be installed in a stand alone computer. Student must register using their ID and username and must take a pre-test in order to measure the student’s ability on how to use date base management system using MYSQL and they can view their lessons and they must take a post test then view their results. The same as the instructor, they register as admin, responsible for the program or account of the students. Computer Aided Instruction for DBMS using MYSQL was using a Waterfall Model in which progress is seen as flowing steadily downwards (like a waterfall) through the phases of Conception, Initiation Analysis, Design, Construction, Testing, Production, Implementation and Maintenance. Computer Aided Instruction will create a great impact both in the head and in personnel of the school. Therefore, the researcher concluded that the implementation of Computer Aided Instruction would provide a cost-effective, smooth operation, more interactive process between the students and teacher. To maintain quality and efficient programs of the college of Information Technology Department, the researcher recommended that the Computer Aided Instruction in DBMS using MYSQL should be implemented. This chapter presents the requirements analysis and documentation, design software processes, development method and testing, system prototype and description, implementation plan and results. The Requirements Analysis and Documentation describe software, hardware and peoleware required for implementation of the system. The Requirements Analysis and Documentation describe hardware, software and peoleware required for implementation of the system. Software Development: Microsoft Visual Basic 6.0,Crystal Reports 10,MySQL ODBC Connector, MySQL, Codejock. 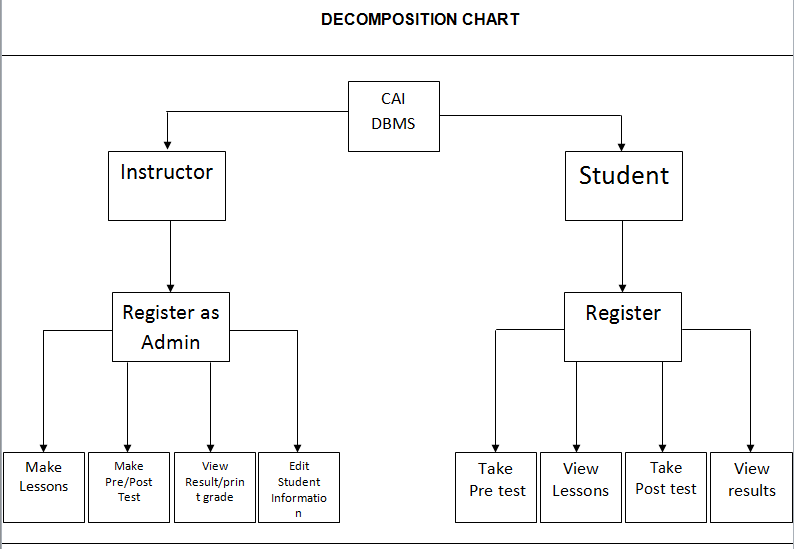 The figure above presents that Computer Aided Instruction in DBMS has two major subtypes the Instructor and Student. The instructor has four major functions; he makes lessons, pre-test post-test, he can view students’ performance or result and he can also edit students’ information. The student has also four major functions; he should take the pre-test first so that he can view the lessons and after that, he can take post test and view his results. Student can compare the result of his pre and post test. The figure above shows that the student will register his/her profile into student information and he/she can change his/her password. This information will be stored in student database. Students must take pre-test first before he/she can view the lessons provided by the instructor and he/she needs to take post-test before he/she can proceed to the next lesson. The instructor will register as administrator so that he can access to admin. The instructor will provide lessons and tests for the students. He can also view and evaluate students’ performance if the students have learning in using CAI. Microsoft Visual Basic 6.0 – Was the chosen programming language for software development primarily because it is an ideal programming language for developing sophisticated professional applications for Microsoft Windows. It makes use of Graphical User Interface for creating robust and powerful applications. The Graphical User Interface as the name suggests, uses illustrations for text, which enable users to interact with an application. This feature makes it easier to comprehend things in a quicker and easier way. MS Word 2007 – Is powerful word-processing software used to create, edit and modify the documentation. It is user-friendly and very suited to the implementation of this study. The researcher found out that Computer Aided Instruction is needed to the students who take DBMS subject for learning purposes. Computer Aided Instruction for DBMS using MySQL is extremely important in the modern world of today. In the fast moving technology, it holds tremendous significance. The importance of CAI in many schools cannot be denied that it is more efficiency and effective to use than the traditional. The researcher found out that is more applicable to adapt in order to the students to increase their learner skills and save times and they did not feel boring. This Computer Aided Instruction for DBMS using MySQL is design for the 3rd year student who taking up the subject DBMS in order improve the teaching process. With this system, students get a pre-test to test their ability based on what they have know and also they can view their lesson easily and study and then they can have their post-test afterward. In coding the Computer Aided Instruction for DBMS using MySQL, we needs a lot of times to store the important detail. All the part of the system must be studied and organise well in order to come up a very good results. It includes log in form of students and teachers in order to access the program as well as the pre-test, post-test, and lesson that is needed. I n testing the Computer Aided Instruction, the 3rd students who have a subject DBMS using MySQL can use the program for testing. As we go on to our study, in this stage the Computer Aided Instruction for DBMS was tested by the 3rd year student of Information Technology who have a subject on DMS .This well be done by random sampling in which student are given the chance to use our program. 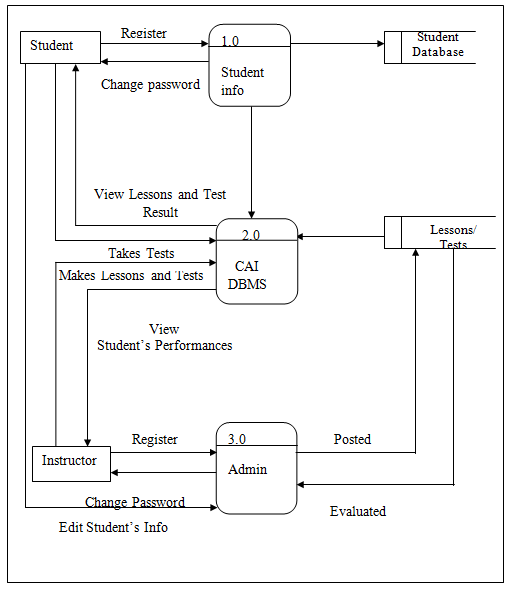 In this stage, the group must present the Computer Aided Instruction for DBMS to the person who will using this system as their instructional way of teaching. And of course the instructor must also examine if it really meet the requirements that he/she wants.